US - US pork and beef exports continued to trend above year-ago levels in June, capping a very strong first half of the year. According to statistics released by USDA and compiled by USMEF, exports also achieved higher values on a per-head-slaughtered basis and accounted for a steady-to-higher percentage of total production. Pork exports totaled 200,229 mt in June, up 6 per cent year-over-year and the largest June volume on record, valued at $527.1 million, up 4 per cent. This pushed the first-half total to 1.25 million mt valued at $3.21 billion – up 13 per cent and 16 per cent, respectively. 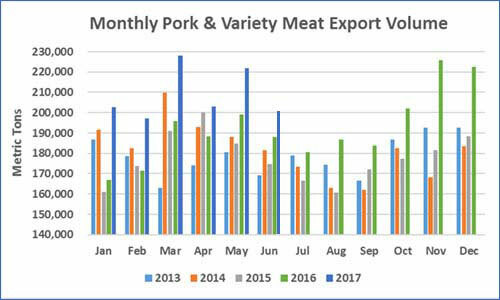 Exports accounted for 27 per cent of total pork production (up more than one percentage point from a year ago) in June and 22 per cent for muscle cuts only (steady with last year). For the first half, with production at a record pace, both ratios increased significantly from a year ago. The percentage of total production jumped from 25.3 per cent to 27.8 per cent, and for muscle cuts the increase was from 21.4 per cent to 23 per cent. Export value per head slaughtered in June was up 1 per cent to $53.41 and the first-half average increased 12 per cent to $54.09. "In this time of large red meat production, the upward trend in per-head export value and in the percentage of production exported is especially critical to the industry," said USMEF President and CEO Philip Seng. "These metrics confirm that we’re not simply exporting more red meat because more is available – those exports are also generating excellent returns. It was also gratifying to see that the US trade deficit narrowed in June due to an expansion of exports, knowing that the red meat industry made another solid contribution toward that effort." Pork exports to leading volume market Mexico remained on a record pace in June, increasing 19 per cent year-over-year in both volume (64,712 mt) and value ($124.9 million). This pushed the first-half total to 398,565 mt (up 23 per cent) valued at $731.6 million (up 29 per cent). A major factor behind this increase is that Mexican consumers are eating significantly more pork, both imported and domestic. Over the past 10 years, Mexico’s annual per-capita pork consumption has increased by about one third, and is expected to reach 18 kilograms this year (carcass weight equivalent), based on USDA estimates. Over the same period, Mexico’s pork production has increased by 30 per cent. Capitalizing on rapid growth in home meal replacement items and other foods that emphasize convenience, as well as duty-free status for most cuts under the Korea-US Free Trade Agreement, pork exports to South Korea climbed 31 per cent from a year ago to 94,545 mt, valued at $258.5 million (up 38 per cent). With a strong second half, exports to Korea could exceed the record set in 2011, when Korea was facing a domestic pork shortage due to foot-and-mouth disease. This year Korea’s imports have been driven by strong consumer demand, as Korea’s domestic pork production is slightly ahead of last year’s pace. While exports to China/Hong Kong fell below last year’s pace in volume (271,297 mt), value still increased 3 per cent ($558.4 million). This reflected the strong price commanded for pork variety meat, as first-half variety meat exports to the region climbed 19 per cent in volume (172,269 mt) and 28 per cent in value ($367.2 million). Led by exceptional growth in Colombia and Chile, pork exports to Central and South America were up 51 per cent in volume (81,930 mt) and 56 per cent in value ($200.3 million). Exports also doubled to Peru and solid increases were achieved in Honduras, Panama, Nicaragua and El Salvador. Strong growth in the Dominican Republic pushed pork exports to the Caribbean up 36 per cent in volume (26,984 mt) and 35 per cent in value ($63.7 million). Exports also increased to the Bahamas, Trinidad and Tobago, Haiti and Barbados. Larger shipments to the Philippines and Singapore helped drive exports to the ASEAN region up 20 per cent in volume (23,207 mt) and 28 per cent in value ($59 million). Led by the above-mentioned success in China/Hong Kong, pork variety meat exports achieved exceptional growth in the first half, increasing 19 per cent year-over-year in volume (286,787 mt) and 32 per cent in value ($580.3 million). Additional markets contributing to this growth included Mexico, Canada, Chile, Colombia and the Philippines. Variety meat export value averaged $9.78 per head slaughtered in the first half, up $2.10 from a year ago.